The Design of Everyday Things (formerly entitled The Psychology of Everyday Things) by Donald Norman discusses the issue of design and functionality of everyday objects and the frustration – and worse – that can arise when objects are ill-designed and not user-friendly. From taps and doors to computers and aeroplane cockpits, Norman (2002) provides examples of poorly designed objects and the impact on the user; ranging from mere annoyance to tragic injury and even death. One of the products he discusses is the QWERTY (also known as Sholes) keyboard, the standard keyboard used with most computers. He outlines the deficiencies of the keyboard and its inappropriateness in the modern world, requiring faster keying speeds and designs that are comfortable for the hands and wrists. He advised that the placement of the keys on the Sholes keyboard is based on principles from the 1800’s relevant to the idiosyncrasies of mechanical typewriters: jamming typebars, advancing the printer ribbon and returning the carriage, features which are not applicable to keyboards in the 21st century. Norman writes: We are committed to [the qwerty keyboard], even though it was designed to satisfy constraints that no longer apply, was based on a style of typing no longer used, and is difficult to learn. Badly designed products such as the QWERTY keyboard persist because people value price and appearance over design, or they are happy with ‘good enough’. While the deficiencies inherent in badly designed objects such as taps and light switches tend to be front of mind because they immediately impede our ability to perform a necessary activity, the disadvantages of the QWERTY keyboard are less obvious and may not become apparent for years. These include repetitive strain injuries, RSI (such as carpel tunnel syndrome) and reduced productivity resulting from slower typing speeds and costs due to injuries. There are a few alternatives to the QWERTY keyboard. One of the keyboards investigated by Norman is the Dvorak keyboard which has re-arranged the keys so that all the vowels are on the home row and placement slightly favours the dominant right hand. However, he found that typing speed increased by only 5-15% using the Dvorak compared to the Sholes keyboard and that there was little to justify this as a useful alternative. For many other examples of ingenious design, see our RSI blog. 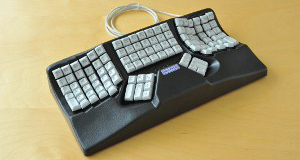 Many testimonials attest that faster typing speeds can be achieved using the Maltron keyboard, and that it is hardwearing, comfortable and efficient alternative for anyone with RSI or wishing to avoid RSI, or individuals who are only able to use one hand. And, at the flick of a switch the Maltron keyboard can be changed to the standard QWERTY design, for those who find it too difficult to make the change. Contact us to find out more and to order your revolutionary Maltron keyboard.